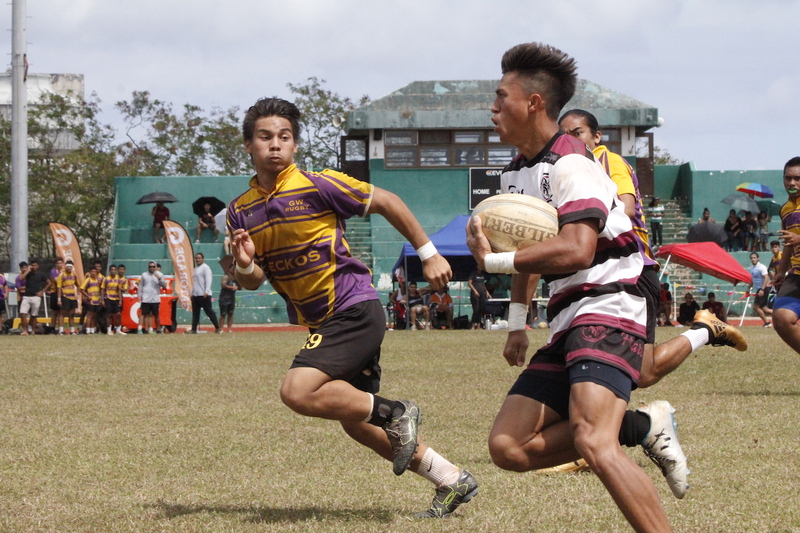 In one of the most intense rivalries of IIAAG high school rugby, the FD Friars got the win over the GW Geckos on Saturday morning at the JFK Field. A big second half by the Friars led by Jalen Delgado and Noah Diaz, who each scored two tries, led FD to the 24-3 victory. Going into the game the rivalry was well known by the players as the two teams have met in the championship game for the past five seasons. “GW is a really good team so going into today we knew we had to work hard and just play our game.” said Delgado. The first half was a defensive battle as the teams struggled to put points on the board. Penalties kept both teams from gaining any momentum. The Geckos worked their way up the field and were able to strike first, scoring a field goal to go up 3-0 at the end of the first half. The Friars came out and immediately got their offense going. The Friars drove the ball down the field and Delgado scored his first try of the day, giving FD the lead 5-3 after the missed conversion. Once the Friars broke through, the scoring didn’t stop, with Diaz and Delgado scoring two tries in quick succession and pushing their lead to 17-3. As the game was winding down, Austin Peredo of the Friars broke off for a big run, that was stopped right before the try line. Peredo unloaded the ball to Diaz for his second try of the game and Matias Calvo kicked the conversion sealing the game at 24-3. Something seemed to click for the Friars after halftime and when asked about it, Peredo stated the confidence game from within the teams ability. “We just stayed calm and collected and played our style of rugby,” added Delgado. Friar coach Lenny Calvo said the message to his team at halftime was simple. The Friars are looking for their third straight championship and this win keeps them undefeated, while handing GW their second loss of the season.